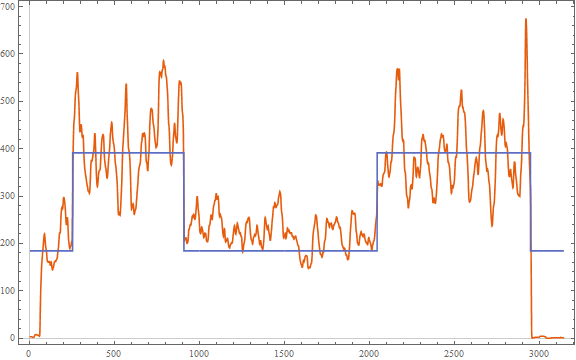 I'd like to detect the points where the center of the time-series shifts (around x=1000 and x=2000). Many of the transforms and smoothing methods I have tried destroy this information. We can visually see that there are 3 "major" subsequences centered around y=400, 200, and then 400 again, but I'm not sure how programmatically locate these major components as continuous subsequences. How can I automatically detect what the underlying linear step function is here? I had a go with HiddenMarkovProcess, based on the assumption that the data is normally distributed around two different means (it looks like it!). This approach should be fine for cases where the number of "states" is small, e.g. 2 in this case. Otherwise you're looking at Infinite Hidden Markov Models, or see the bottom of this answer. 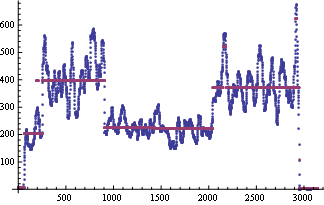 You can see that the "big" changes you refer to at x=1000 and x=2000 are actually picked up at 907 and 2044. Another approach is to use compound median filtering which returns a blocky function. Then threshold the jumps between blocks. No assumptions about the number or size of blocks is made. Function to plot the input series as discrete jumps. Median filter until the signal does not change, then repeat for successively wider window radii r.
Find locations where the signal jumps more than the threshold t.
Subsample the imported data v down to w, for faster execution, and find the maximum. Both are global variables. Adjust the maximum filter window radius r, and the jump threshold t.
Not the answer you're looking for? 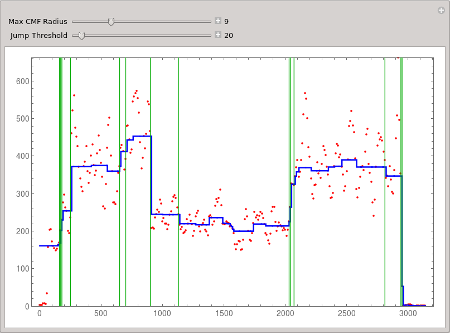 Browse other questions tagged pattern-matching data time-series wavelet-analysis or ask your own question.